Wow! It’s been two whole months since I last posted. I think my sewing mojo crawled into a hole and died somewhere during that time. I have had no motivation or inspiration to sew a stitch. I started a dress and just couldn’t bring myself to complete it. Then I cut out a dress last week but am just feeling too lazy to change out the serger thread. Sigh. I even had plans to make my first bathing suit, but that kind of went out the door, along with the phenomenal Burda maxi dress I had planned to make. I’ve been reading a lot though, the Twilight Trilogy to be exact. I’m halfway through Eclipse, and I’m really not liking Bella or Edward right now! LOL! I think I just need to start over with a new sewing plan. Maybe even a new SWAP for the fall. 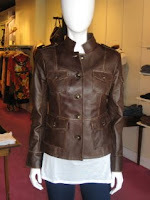 I saw a cute military-style jacket in an email newsletter that’s being sold in a Chapel Hill boutique for $839. I think I can make it for slightly less using McCalls 5190. What do ya’ll think? Of course, it will be a while before the weather calls for a jacket in North Carolina, but it’s always good to get a head start. I’ve also been house hunting, so that’s taken up quite a bit of my energy. I put an offer on a cute two bedroom townhome, so we’ll see what happens with that. If it doesn’t work out, I know God has something else for me, and I’m not worried. It’s been fun checking in on everyone else’s sewing and crafting. A good pal of mine, Andrea, caught the quilting bug and opened up her own Etsy shop: Greener Beginnings. Check it out! Her quilts are fab, and made with love. And I need to get on my hustle and do what I know the Lord has been gifted me and encouraged me to do as well through other people. Pray I’ll get over my fears and drum up the motivation to make it happen! All right ya’ll, I will be checking in more often–definitely sooner than two months. @Grundi, thank you for stopping by my blog. I'm so happy my projects have been an inspiration to you. Glad to know you are well and thriving. I hope your house deal works out for you. It would be great when your mojo returns full force. You are so inspiring. Happy fall season. Nice blog. I'll be checking it out. Krustallos – just wanted to drop a line to tell you what an inspiration you were to me! I found you on Google looking for tips on a maxi dress. So inspired by the New Look one you made I tried the same pattern myself. Beginner skills – but am so excited to do more. Already out shopping the cool Butterwick Retro patterns. Thanks for being the spark for me! I posted process pics of the NL dress on my blog/Facebook. Can't wait to start another project. I would love to see you make the jacket! Welcome back! Glad to see you back!! I love that jacket!! It will look great! Good match on that pattern. We all take break from our crafts and blogging.We need that break sometimes.Can't wait until your sewing mojo comes back!Because mind has left the building!!LOL! Thanks for the shout out Krystal!! Hoping to get a few more on there soon. And I love the jacket- you would rock that! Don't worry, everyone needs a break once in awhile. You'll get your mojo back soon and be in a sewing frenzy before you know it!! I'd love to see you make that jacket, and the pattern is perfect. I've only made small things from leather and would love to see the process of a whole jacket (especially that cute one). Welcome back! And good luck!